At Age 3 — Transitioning From Jack To Jackie : NPR Ed What would you do if your 3-year-old son told you assuredly that he wanted to be a girl? An Oakland, Calif., couple told their child it was OK, and sad, sad boy became a joyful little girl. It's controlled after-school anarchy at the Christian-Carter household. Seven-year-old Chloe has rolled herself up in an exercise mat in the living room of the family's Oakland, Calif., home. "Look I'm a burrito," Chloe shouts. Her 4-year-old sister, Jackie, swoops in for a bite — and a hard push. "Ow!" Chloe shouts. "Mom! Jackie pushed me!" Just two sisters playing, occasionally sparring, as dad, James Christian, and mom, Mary Carter, watch nearby. Jackie's birthday is in mid-October, but for Carter and Christian, a second date is seared in memory almost as intensely — what Carter calls "The Day." "It was May 15, 2014, and I remember the date because Jackie was out of school that day," she says. "We drove to drop her older sister off at kindergarten. And normally Jackie is quite happy and content to hang out with me and play." Jackie was 3 then, and she was called Jack. Glancing into the backseat of her car, Mary noticed something different. 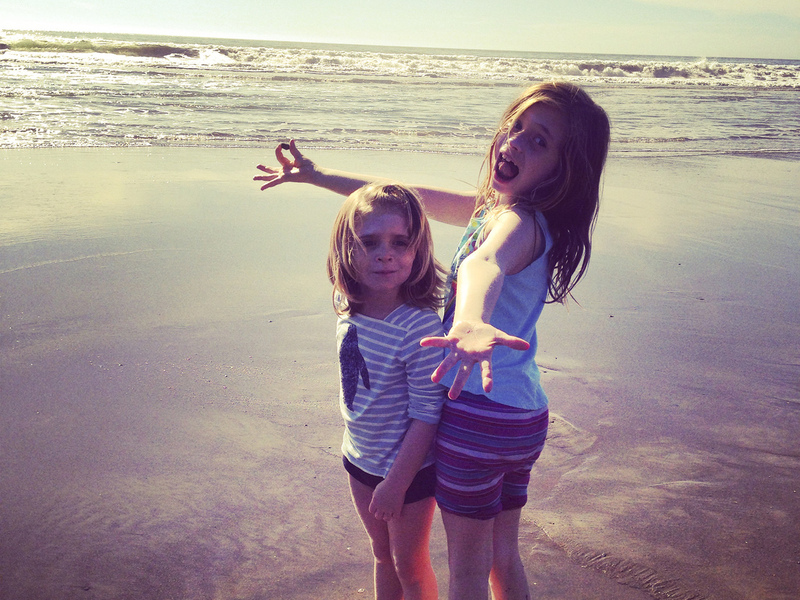 Sisters Jackie Carter Christian (left) and Chloe Marie Christian at the beach. "Jackie just looked really, really sad; sadder than a 3 1/2-year-old should look," Carter says. "This weight that looked like it weighed more than she did, something she had to say and I didn't know what that was. "So I asked. I said, 'Jackie, are you sad that you're not going to school today?' And Jackie was really quiet and put her head down and said 'No, I'm sad because I'm a boy.' "
Carter was taken aback. Her youngest had been wearing her big sister's dresses regularly and enjoyed donning pink boots. But this was new. Carter wanted to confirm. "You're really not happy being a boy?" she asked. "I thought a little bit longer and I said, 'Well, are you happy being you?' And that made Jackie smile," she says. "And I felt like for that moment, that was all that really mattered. That was 'The Day.' "
Carter took her to a chain drugstore, and Jackie asked for elastic hair bands. Her hair wasn't long enough yet, but Carter put Jackie's hair up in five makeshift ponytails. "And I've never seen such a happy child," she remembers. "To go from maybe an hour before this, this child who looks so sad, to that, I felt like I'd done something right by her." In the months that followed, they started talking over girl names, with help from Jackie's pre-K teacher. On her fourth birthday, the family sang happy birthday for the first time to Jackie. A new job for Christian had prompted the family to move from Atlanta to Oakland two years ago. Carter and Christian say they feel lucky they've landed there. The Bay Area is one of the most LGBT friendly regions in the nation. The challenges ahead might be far greater, Christian says, if they'd stayed in the South. He recalls the Fourth of July weekend last year, when they were back visiting Atlanta. At a community party, Christian noticed a group of kids gathering around Jackie, who still went by Jack back then. "There was a point when some of the other boys, alpha males, talking about 15 kids surrounding Jackie," he says, "wanted to challenge this notion, 'Wait a minute, you said you're a boy but you're wearing a dress and have ponytails. I don't understand that.' "
Christian says he felt anger at first. "Then joy, when this girl of about 9 stepped in and said, 'This is Jack, he's my friend.' And Jackie stood her ground, and so that made me very proud," he says. It's only been a little more than a year since Jack became Jackie. Neither of her parents has any illusions about the potential struggles ahead. Transgender people have alarmingly high rates of depression, substance abuse and suicide. "There will be more challenges, certainly, as Jackie gets older and gets around more kids," Christian says. "Then puberty, and dating, and the challenges will be like a very steep curve. But I'm hoping that by the time she gets there, I hope, one, we've given her the tools and two, that there's more acceptance of this issue." There is more acceptance now than there was even a few years ago, says psychologist Diane Ehrensaft at the UCSF Benioff Children's Hospital. Ehrensaft has worked with transgender youth for more than 20 years. "We as a culture have lifted the lid so that kids can start speaking up, showing themselves and that we have a lens to understand it from," she says. "That's all very new. We are now much more commonly hearing very little children speak up, 'Please let me be the gender I am rather than the gender you think I am.' "
Experts in the field diverge on how to approach gender identity issues in the very young. Jackie's parents know some people may not understand their approach. It is even hard for them at times. As Carter explains, her daughter Chloe is the only one in the family Jackie still allows to occasionally refer to her as "Jack," as "he" and as "brother." "Chloe is very loving and protective and supportive," she says. "But I think for Chloe, she still attaches this memory of her little brother, of Jack. And it's right now hard for her to let that go. It's that last piece she's holding on to." "I myself have times when I miss my boy," says James Christian. "And I look at the old clothes and the old pictures and I will miss Jack. And that's probably never going to go away. That's just going to take some time."